It's the mobile everybody's talking about. 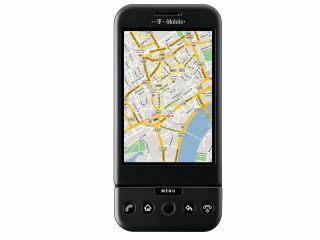 T-Mobile's new G1 is the first Android phone available in the UK. Android is a revolutionary new and easy-to-use mobile operating system backed by Google that enables you to download applications and access the internet on the go far easier than ever before. But the G1 revolution isn't just about Android, here are 10 more great reasons why it's the phone to watch. The G1 is truly cutting edge, featuring the very latest in connectivity options with built-in Wi-Fi and high-speed 3G/HSDPA for mobile internet access as well as a built-in GPS receiver for tracking your current location. As well as having a brand new interface, the G1 has a full touchscreen and easy finger navigation. Using it one-handed? Then there's also a convenient trackball you can use, too. Android is backed by the mighty Google, so you'll get the latest Google services such as Google Mail and Calendar. There's even one-touch access to Google Web Search. Built-in support for YouTube enables you to easily search for and view videos via a special application on your phone. The G1 has a hinged touchscreen that slides open to reveal a full QWERTY keyboard - you won't miss a letter when you type your texts and emails even when you're on the move. No dodgy letter touches or keypad presses. As well as Google Maps with its satellite and map views, you also get built-in location-based GPS, so you can find out where you are in an instant. The G1 also supports Google Maps Street View – enabling you to view online images of your surroundings and navigate 360 degrees just by rotating the phone around you with your hand! The UK isn't supported yet, but you can check out street level in major US cities and Paris right now. The T-Mobile G1 is the first phone to provide access to the Android Market, where you can download applications and personalise your phone to make it more your own. Choose from all kinds of apps including games and music, and download applications on-the-go. The G1 has a full HTML web browser including a special zoom function. You can expand any page section to read it by simply tapping on the screen. There's also a full email client that enables you to receive Rich HTML emails. It can be set up with any POP3 or IMAP email account, or Google Mail, too. All text and graphics can be displayed, blowing the old notion of useless mobile email right out of the water. As well as support for 3G and EDGE, the G1 also has fast HSDPA/HSUPA mobile broadband access via T-Mobile as well as Wi-Fi. The G1 will seamlessly transfer between 3G and accessible Wi-Fi networks. As well as support for MMS and SMS, the G1 has the most advanced text handling available; you can easily flag, delete or move groups of messages, and keep track of group conversations through threaded text messaging. Chat to your online friends wherever you are using Google Talk. You can chat with friends through their Google Mail web interfaces or the freely downloadable Google Talk client.